EKT 90 Inc. is a Thunder Bay-based company that has worked in Ontario, Manitoba, Saskatchewan, Nova Scotia, and Quebec in Canada; Georgia, Louisiana, Mississippi, and New York in the United States, and abroad in Costa Rica and Romania. 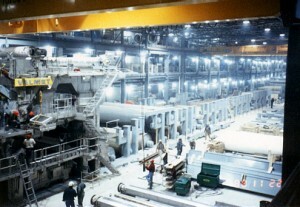 EKT Industries was formed in 1983 by Jay Sinclair and Denis Magne, bringing together their former companies Sinclair Engineering, Kamtar, and Tamarron. Prior to the formation on EKT, Tamarron completed turnkey projects in Long Lac, Nakina, Geraldton, and Beardmore, and was a partner in the $280 million greenfield Great Lakes Paper mill in Dryden (now owned by Domtar). EKT 90 Inc. was formed in 1989 with the addition of a third partner. The EKT history of work includes new paper machine installations, paper machine rebuilds, equipment installations, heavy mechanical conveyor systems, structural erections, piping installations, and civil projects. Specializing in installation which require Mill shutdowns, EKT has established a record of completing projects on time, on budget, with a high degree of workmanship. See our Projects for some examples. The EKT success is a result of new construction, rebuilds and maintenance shutdowns in the pulp and paper industry. With the closing of paper mills in Canada and the rise of new mining activity, EKT has established itself by installing all the above ground processing equipment, steel tanks, piping including rubber lines, and conveyors at the Rubicon Phoenix project in Red Lake. Installation of all process equipment from the leach tanks through to the gold brick including tanks, piping, pumps, instrumentation, support steel, walkways, electrical and H&V at the New Gold Mine in Rainy River. New installations, equipment replacement and maintenance at Goldcorp Musselwhite, Lac des Isle, and Inco. © 2019 EKT90 INC. All Rights Reserved.